languagehat.com : They Perished Like Avars. I was looking through Vasmer’s etymological dictionary when I ran across the entry обрин [obrin] (plural обре [obre]), the Old Russian word for Avar. Vasmer says it’s related to a Slavic word for ‘giant’ (Slovenian óbǝr, Czech оbr, Slovak оbоr, Old Polish obrzym, Polish olbrzym) and Byzantine Greek ᾽Αβαρ (plural ᾽Αβαρεις, ᾽Αβαροι), but beyond that its history is unclear. When I googled the Russian word I found the Old Russian phrase погибоша аки обре ‘they perished like Avars,” which comes from the Povest’ vremennykh let and is apparently used ironically to mean ‘they vanished without a trace.’ I thought that was piquant enough to pass along. My Rejzek (an etymology of Czech) has an entry for “obr”! It describes the word as “commonly associated” with the name Avar but is less certain that that name is actually the source of the word for ogre. If I’m reading him right, he seems to think that the first attestation of the word in Old Russian, far from the limits of Avar power, needs to be taken into account. He closes with citations of Gothic abrs “strong, powerful” and Greek óbrimos “strong, violent” as words with more and less convincing connections. I can see his counterexample, but it is possible some Slavs that might have gone one to speak Old Russian would have had the chance to come across the Avars as they moved west towards the Danube (and their eventual meeting with the eventual speakers of Czech, Slovak, Upper Sorbian, Polish, and Slovenian (the modern Slavic languages other than Russian with a reflex) as well. I always get the Avars confused with the Alans. Never can remember which one there’s two of. Both, IIRC, but in one case (Alans) they’re likely to be the same, and in the other (Avars) they’re probably not. On the phrase itself – I recently realized that the word обре (if it really comes from “Avar” and not something else) is yet another witness for Proto-Slavic *a (where *o is expected). I don’t see where the irony comes in. The Avars have vanished without a trace, given that the modern Avars aren’t the same folks. The irony would be in comparing whatever modern person or entity you’re talking about to the Avars, and putting a modern-day situation in the context of the Old Russian chronicles. The issue of the extent of Avar power in Eastern Europe is not settled. There is somehow a persistent conception that it’s eastern border run at Carpathian mountains, but this is not supported by archaeological evidence. I think Avars ruled all over modern Ukraine, including most of the territories where Kievan Rus emerged several centuries later. See https://en.wikipedia.org/wiki/Pereshchepina_Treasure found in Eastern Ukraine. Was rereading this passage in the Chronicle last night. Not too ironic – rather, the chronicler monk expresses a linguist’s familiar awe about the idiomatic expressions of his time still retaining the memory of the forgotten historical events. The Chronicler explains that he’s familiar with the “disappeared like the Avars” metaphor even though over 2 centuries passed since their rout and nobody could remember anything for certain about the Avars anymore. (He even seems to be confused between the Oghurs, contemporaneous with the Avarian invasions, and the later, and similarly named Hungarians, spinning the notion of the “two kinds of Hungarians”, the White ones and the Black ones). In a typical tall-chronicle fashion the Avars become giants who rode carts driven by groups of Slavic women (the Dulebs from River Bug, it explains). The topic suddenly sprung back to live this summer with the publication of two ancient DNA papers. One looked at the late Avars of the Longobard migration era, and found that some of them were indistinguishable from today’s Western Slavs. Another looked at the earlier warrior graves from the zenith of the Avar power, and they appeared to be East Asian in composition. Fascinating! DNA studies are really exploding. The system keeps deleting my other link 🙂 where, along with dozens Longobardi, the reasearchers snagged a couple of (not really wanted) Avar burials in the same cemetery in Pannonia. Sorry, your comments got caught in moderation — I freed them as soon as I woke up! Very interesting, but I hope the “phylogenetic” analysis in the preprint is replaced with something closer to the state of the art before peer-reviewed publication. Neighbor-joining in PHYLIP?!? Which century is this? Another new paper attempting to show a correlation between genetic and linguistic proximity in the Uralic languages, and peculiarly finding no trace of the Avars or indeed “the original Hungarians”. An important observation is that although most Finno-Ugric peoples are substantially genetically similar to their neighbors, they present with a large swath of genetic ancestry best represented in Khanty and Mansi, as well as Selkups and non-Uralic Kets. In the Volga-Ural region and further to the North, most neighbors of the Finno-Ugric peoples (including Turkic Chuvash / Bashker / Tatar and Slavic Northern Russians) are only a little behind in their share of the same (presumably Proto-Uralic / Paleosiberian component) which isn’t too surprising considering the demographic history of the region. Estonians possess very little of this presumed PU DNA, and aren’t that different in this respect from their Latvian neighbors (perhaps the extinct Livonians are responsible for the latter?). But in Hungarians, they couldn’t see anything “Proto-Uralic” in their DNA at all. Very interesting, thanks for the tip! The Khantys and Mansis have quite obviously gone through a language shift, which I think makes it seem likely that this “Khanty–Mansi-like” cluster K9 does not represent Proto-Uralic speakers, but rather some earlier stage of population movement (as I believe Trond is also saying). This would go well with its absence from Estonian and Hungarian: early southerly latitudinal expansion, followed by spreading northwards with admixture from earlier populations, and the later extirpation of Uralic from most of its original early range by Russian/Turkic (/? Iranian). At least in the Finnish/Estonian case, we know quite well that the Proto-Finnic homeland was in northern Baltia, and that Finns have partial Sami ancestry. Shame that Ingrians proper / Votes / Livonians were not sampled here, but there will be time for that later still (the languages are all moribund-to-extinct, but this is due to language shift, not demic replacement). One intriguing sub-result is how this study also shows that the Mansi have a particularly large range of genetic variation, seemingly in three components — per Fig. 2a a western group close to Mordvins and North Russians, a central group close to Komis, and an eastern group close to Khantys. Not as strongly, but yes. When the K9 signal is strongest in periferal regions and in Ket, it looks like a substrate to me. In North Fennoscandia the language shift from some Non-Uralic language to Sami happened in the first centuries CE or thereabouts. The relation between Siberian and Finnic populations disappears at K11. I’m not sure what that means, but maybe a deep split in the shared Siberian ancestry. I agree that the Mansi results are interesting. The Ob-Yenisei cluster of Eastern Mansi, Khanty, Selkup and Nenets could well have been Yeniseian speakers before the shift to Uralic. That fits what I’ve heard about toponymic evidence in the Ob-Yenisei basin, but it’s in the wrong direction for the Dene-Yeniseian link. I’d like to see what happens if they add North American data. There are about no Yeniseian loanwords in Ob-Ugric though, alas. My money would be on some entirely extinct group. Though I’ve seen at least one guy propose that some of the toponymic evidence has been interpreted backwards and would rather indicate Ugric substrate or loanwords in Yeniseian. Mansi, Khanty, Selkup and Nenets share a few linguistic areal features too, e.g. retention of *w as labiovelar, or being the only Uralic languages that neither retain geminates nor have introduced voiced stops. The latter I’ve already suggested earlier as a common substrate feature. So a shared unknown substrate in Ket and “Ob-Yenisei Uralic”. Sakhartya? On another note, the real outlier in Uralic is Nganasan. What’s going on there? I wouldn’t be very surprised if the Yeniseians turned out to be relative newcomers to Central Siberia. I must have said before that I suspect a Dene-Yeniseian homeland on the Arctic Coast, with a first spread zone from Yenisei to Mackenzie (a range of a similar extent as Eskimoan) and migrations up the rivers being later developments, maybe even as a result of new groups spreading on the coast, either coming down from the Baikal area or north through the Bering Strait. When I said North American data would be interesting, it’s also because of the cluster of Koryaks, Chukchis, and partly Nivkhs and Evens. If you mean the Sikhirtya: no, they were from the Barents Sea coast and they probably had nothing in particular to do with any Paleosiberians. If we want a label for a hypothetical Ob-Ugric++ substrate, already Helimski suggests that the name “Yugra” could be even pre-Uralic. Seemingly the implication would be that this name has been only folk-etymologically associated with Onogur > Hungary (similar to how the h has been added by folk-etymological association with the Huns). If you mean the Sikhirtya: no, they were from the Barents Sea coast and they probably had nothing in particular to do with any Paleosiberians. Yes, thanks, stupid error. I love the word Sikhirtya almost as much as Ymyjakhtakh, But Yugra is a good word too. I agree that the name Sikhirtya is known from too far away to be applicable here, but I also think they could have come to the Barents coast from the east, e.g. in the K9 (per above) spreading event. On another note, the real outlier in Uralic is Nganasan. Nganasans have a decent share of seemingly non-Samoyedic vocabulary, mythology and cultural traits (e.g. reindeer hunting rather than husbandry), which have for long been suspected to be substrate influence. This would check out chronologically. Apparently archeology shows southern Siberian ceramics spreading to the Arctic Sea around the first half of the first millennum CE, followed by long-term cultural stability ranging to the present day, and this transition would make a natural point for the northern expansion of Samoyedic. (Driven by the domestication of reindeer, probably?) Human settlement however goes much further back, even on the Taimyr peninsula. While previous research has not managed to find any loanword connections, apparently V. Gusev has recently identified a handful of suspiciously specific syntactic commonalities between Nganasan and Yukaghir. This might be the first real lead on the identity of the substrate. A coastal homeland does not match up very well with how almost all of the groups are today inland. The only marine mammal hunters are the Dena’ina in southern Alaska, which possibly involves language shift from an Aleut substrate. Yeniseians as newcomers sounds good to me, but a Central Asian route of entry seems better already from how the Yeniseian languages get more diverse towards the south, not the north. Wow, thanks! If you look for a candidate for a substrate in Nganasan, and base it on nothing but maps, Yukaghir is a pretty obvious candidate. Based on nothing but maps, I’ve also thought that there ought to be a Yeniseian substrate in Enets. When I want the Arctic Coast to be the homeland and/or route for Dene-Yeniseian, it’s one of those hypotheses of mine that tend to get knocked down by the slightest of evidence. But disregarding that for a moment longer, my three arguments are (1) it’s the shortest route, (2) those who live there often travel long distances on a regular basis, and (3) we know of a language family with a similarly wide circumpolar distribution. If we think the Yeniseians came from the south, they are so riverine that it’s hard to see how they could have crossed from anywhere by foot, and I want to suggest that they specialized in transport of Taimyr bronze to the Seima-Turbino workshops, gradually increasing their reach by boat from the southern end of their known realm. But this trade could also just as well have pulled them up from the coast. I gather that there were two culturally distinct centres of bronze production in the Taimyr peninsula, one western towards the Yenisei, with ties to the south and west, and one on the eastern side, connected to the surrounding hunting culture. We might hypothesise that the western centre was ‘Yugri’ and the eastern Proto-Yukaghir. Or either one could have been Yeniseian. Nice! I’ll have to read that ASAP. Reading this Hungarian paper, I kept remembering the recent grandstanding about David Reich ( http://languagehat.com/the-reich-backlash/ ). Sure, these local university researchers did all the work without international colleagues and without any help from the top-tier ancient DNA lab. But they also did a remarkably poor job in investigating autosomal DNA, plucking just 26 obsolete “contemporary population-related informative markers” from the sea of millions of markers which could have really made sense of what ancient populations combined to yield these DNA samples, and when. Instead of trying to identify the ancestors, they concentrated on predicting the mere “looks” of the warriors. And I was, like, wish David Reich was there to help! Yes, I was surprised at the crudeness of the report, e.g. on the contributions to the amalgamated “Conqueror” genetic heritage, but thought that might be just their choice of emphasis in the writeup. I trust you that this actually reflects the questions asked and answered in the study. Either way, could this “racial” angle play to current public or political interest in Hungary? Could it be a teaser or a preliminary report, meant to spur interest where interest is most easily spurred and ensure continued support or funding for a more advanced analysis? If that doesn’t follow, won’t their published data be available for analyses by other labs? I was surprised at the crudeness of the report, e.g. on the contributions to the amalgamated “Conqueror” genetic heritage, but thought that might be just their choice of emphasis in the writeup. I trust you that this actually reflects the questions asked and answered in the study. Either way, could this “racial” angle play to current public or political interest in Hungary? Could be politics or nationalist sentiment, yes. One might try to look up the authors in the news and social media to make a better guess. But they didn’t collect data anywhere else in the genome, so one is essentially left with male-line Y-chromosome ancestry implication, still leaving much of the genesis of Hungarian language and population in the dark. The majority of the Y-DNA lineages they uncovered can be traced to Germanic and Slavic populations. About 1/6th belong to haplogroup N which is hypothesized to be ancient Uralic, but the evidence is more or less circumstantial as it is also widespread in Baltic and Slavic groups, but so far hasn’t be found there before the Iron Age, so it’s most likely due to the Finnic migrations. But what was the full genetic makeup of the bearers of haplogroup N Y-chromosomes in the conquest-era Pannonia, remains unclear. Conspicuously, there are no N-group Y-chromosomes in Hungary today, making me wonder if the Finnic speakers were the subjugated substrate who contributed language, and maternal lineage, to the post-conquest populations, but few if any male lines? In one way or another, the N haplogroup males must have been prevented from procreation, yet the language ended up being Finnic. It’s harder to imagine this outcome if they really constituted the ruling class. OK maybe they were the ruling class of some early wave of invasion, who later lost their influence and probably lives to another wave or to a civil war within? Then, suppose there was no contamination with contemporary DNA in the study. Where are the Turkic Y-chromosomes then? Did the authors select burials to exclude Turkic gravesites? One of the “Conquerors” Y-chromosomes looks Iranian, but then Y-chromosomes persist for so long, it’s hard to guess what a lone find means without, again, autosomal data. I didn’t mean to imply that the team has any nationalist agenda, just that they may have adjusted the questions asked in a preliminary study to the climate of the society around them. The lack of Turkic Y-chromosomes would speak against that, if the little I know of Hungarian nationalism is correct. They get around this issue by noting the high frequency of similar N-haplotypes among the contemporary Bashkirs, and drawing parallels with (often dubious IMVHO) historic sources equating Hungarians with Bashkirs, and later hypotheses that Bashkiria was the location of legendary Magna Hungaria. I don’t believe that this is the best interpretation, as all Volga basin Turkic / Finnic / Slavic groups have the same type of Y-DNA as well as autosomal Finnic affinities, so it may be easier to attribute both Bashkir / Tatar Y-DNA and autosomal DNA to the Finnic substrates of Volga-Kama Basin, predating the Volga Bulgaria and Bashgort?But it is also true that similar chromosomes are found further East too, closer to the Altai Urheimat of the Turks. But check Fig.1 there, it looks very intriguing (if it is still confirmed by the far larger volume of recent data). N3a2 and N3a4 is where the Pannonian Conquerors map. This whole section of the tree suggests wide dissemination of N3 Y-chromosomes in the 3rd millennium BC, leaving seeds across Eurasia from the Baltic to the Bring seas across a variety of language groups – with each “seed” later sprouting into a rich branch. The authors even mention Seima-Turbino phenomenon as a possible vehicle for such a wide-range, short-lasting spread. My post about Turkic and possibly even, gasp, Seima-Turbino connections may be stuck in moderation due to a link, but in the meantime I looked up the authors. Last author is a respected fruitfly geneticist who completely switched to archaeological DNA very recently. First author got his PHD in 1984, didn’t seem to be heavily involved in research, recently joined archaeological DNA and defended D.Sci. No obvious agenda in their position, but it seems obvious that funding priorities changed in the academia there. This is what powers that be want done. In case anyone is wondering, I’ve read it and find nothing to add to the discussion. 🙂 The Far East Asian ancestry of some of the male Avar lineages fits Futaky’s Tungusic words in Hungarian and Helimski’s Manchu-like reading of the golden bowl of Nagyszentmiklós (fully legible Greek letters representing an unknown language… and probably the first attestations of the etymology-free Slavic title župan), but it’s not specific enough by far. Whole genomes compared in ADMIXTURE would be interesting. I forgot to mention that they also quote their own recent paper Mitogenomic data indicate admixture components of Central-Inner Asian and Srubnaya origin in the conquering Hungarians (which I still haven’t had time to read). Not sure if last year’s mitogenomes paper has been discussed here. They tried to make a big point from the observations that mtDNA of the Conquerors was very much unlike that of the Finno-Ugric peoples to the North-East, and also didn’t contribute all that much to the modern population of Hungary. I would say, big deal. These were male-dominated societies of migrating warriors; of course they took wives wherever they passed, so as they passed the Pontic Steppes, they must experienced a lot of mtDNA turnover; and as they settled in Pannonia, more turnover still. But the authors hypothesize that Hungarian was a substrate language pre-dating the conquest, and that the conquerors were all Turkic. Actually we know for a fact that SOME of the conquerors were Turkic. By sampling 4 cemeteries from an edge of the Pannonian plain (3 of which are within a few hundred meters from each other), one can get a pretty good idea about some members of the conquering tribal confederacy, but not about ALL members of said confederacy, right? Perhaps run of the mill Finnic Y-DNA is somewhere out there, but not sampled yet. Incidentally they also equate Oghurs (better known from the times of Bulgars and Avars) with Hungarians (better known 2 centuries later) in the same as did Nestor the Russian chronicler in the opening post (who mentioned “two kinds of Hungarians” right around the Avars (Avar’s contemporaries “white Hungarians” in early VII c. and Oleg’s contemporaries “black Hungarians” in late IX c.): придоша угре бѣлии и наслѣдиша землю словѣньскую, прогнавше волохы, иже бѣша приялѣ землю словеньску. Си бо угри почаша быти пр-Ираклии цесари, иже ходиша на Хоздроя, цесаря пѣрьскаго… then Avars and then: По сихъ бо придоша печенизѣ, и пакы идоша угри чернии мимо Киевъ послѣже при Ользѣ. Pechenegs in Nestor’s quote, who passed to the West after the Avars but before the Hungarians, are also said to have included Finno-Ugric allied tribes. According to the generally accepted etymology of the ethnonym “Ugry”, it comes from the ancient Turkic word “Ogur”, included as a component in many ethnonyms of the Ogur peoples: Onogurs, Uturgurs, Kuturgurs, etc., and meaning “horn”. In other words, the Magyars while still in the Urals region adopted a Turkic ethnonym, being recent newcomers to the nomadic steppe way of life. Conspicuously, there are no N-group Y-chromosomes in Hungary today, making me wonder if the Finnic speakers were the subjugated substrate who contributed language, and maternal lineage, to the post-conquest populations, but few if any male lines? In one way or another, the N haplogroup males must have been prevented from procreation, yet the language ended up being Finnic. Perhaps run of the mill Finnic Y-DNA is somewhere out there, but not sampled yet. This was all a bit confusing to parse at first, so allow me to suggest an adjustment to prevent further confusion: please use something else like “Uralic”, “Finno-Ugric” or “Ugric” here! Today “Finnic” is all but universally taken to refer to the Baltic Finns. While past usage has been more extensive, it has also never been considered to include the Hungarians. The hypothesis that there was already a pre-Árpádian Uralic intrusion into Pannonia is not entirely implausible. In that case though I would think that it was this substrate who were the Ungari of medieval sources, not the Magyars of 895 (which would add up, interestingly enough, to an entirely parallel situation as with Finns / suomalaiset). It is regardless certain that also Árpád’s people at least included speakers of Hungarian among themselves: a small number of Hungarian words have been recorded already in early medieval sources, before the Pannonian conquest, most prominently the ethnonym “Magyar” itself: mjɣriyyah reported by Arabic travellers as a people living on the Volga, Μεγέρη as one of the “Turkic” tribes living within the Byzanthine Empire. I read that the Pechenegs pushed the Magyars westwards several times. First in the early or mid-9th century from their homes in the Don-Volga plain (after having been thrown out of Central Asia by the Oghuz), then west of the Dniepr in 892 (as allies of Byzantium), and finally into the Pannonian basin (on behalf of the Bulgarian tsar). Barbarian hordes can’t even enter a timeline without turning it into a mess. Very often the few Y-chromosomal markers deemed informative today may help today’s researchers identify some distant ancestors of the “hordes” – whose members were in fact fairly genetically quite distant from those ancestors (because the nomads had a habit of mixing with the local population wherever they stayed for a while). Didn’t we already discuss last year’s Nature whole-genomes publication on Scythians and Hunns, among others? Who showed that the Scythians, while culturally quite homogenous, were heavily admixed with Siberian peoples in the Eastern range of their domains near Altai, and equally heavily admixed with European populations to the West in Pannonia? The same Hunns, about whom the recent paper from Szeged says that they were clear-cut descendants of Xiongnu, turned out to be mostly Saka Irianians by DNA in last year’s paper, although with a sizeable chunk of Xiongnu-like heritage too. The Cumans / Hung. Kuns who in turn kept chasing the Pechenegs further and further West, in alliance with the Russian, Bulgarian and ultimately the Hungarian and Georgian rulers (and inspired a crusade against Hungarian King Ladislas IV “the Kun”, as well as famous onomatopoeic line of Russian poetry, “в пяток пътопташа поганые пълки половецкие в поле) may illustrate another classic complication of nomadic identity: that people may argue without an end if group X was an offshot of group Y or a later-years ally of group Y. It’s usually claimed that Cumans are a part of Kipchak, and the later split off Kimak. But last year’s Nature article suggests that the Kimak were Yeniseian, Kipchak Turkic, and Cuman also Turkic but merely allied to the Kipchak. Didn’t we already discuss last year’s Nature whole-genomes publication on Scythians and Hunns, among others? That one is news to me. I was surprised not to find it here, too. Surely discussed it before. Was it on facebook, or in some more “genetic-centered” places online? Of course it barely samples all these groups spread from Hungary to Manchuria and over 3 millennia, and tribal / genetic heterogeneity of the Steppe peoples may mean that some of their important components remain missing. But the pattern of repeated migration punctuated by short-term stasis with inevitable population mixing is impossible to miss. The thread on plague is equally fascinating. Reading on archaeological riddles like Pereshchepina Grave I start wondering if the “partial” archaeological or history clues often lead to questionable attributions just like “partial” DNA data from mtDNA or Y-chromosomes. Like Pereshchepina’s coin hoard dates leave no doubts that it belonged to the Avars, but other components are poorly compatible with the Avar context and lead to a semi-official conclusion that it belonged to Bulgars who appropriated Avar’s treasure. Yet there is also IV-VI c. Iranian silver and gold which are so out of context in this Dnieper river region location. Some of the silver vessels would be more in place on Kama, a part of the Sassanid fur trade pattern as I recall. But gold vessels are totally unique and some researchers insist that they could only have come from the Khazars who allied with Emperor Heraclius in 627 and routed the Persians, taking troves of treasure. So was it the Khazars taking Avar coin treasure from the Bulgars? What would we conclude from finding only a few of the many clues in this collection? And then it seems that the old historians were too bewildered by the ever-changing array of the barbarians, trying to make sense and see patterns in their names and habits, like lumping together all possible Ogurs or Magyars? Just before the Avars there were the Antes who are often described the by the Greeks and the Goths as being of the same kind as Sclavenes or Veneds, either culturally or physically or even linguistically. But it seems like the Antes’ archaeological finds can’t ne reconciled with them being just another group of Slavs? Did the old historians just behave as the language-lumpers of today?? The most obvious explanation of Pereshchepina treasure. In 635 AD, Kubrat, chief of Onogur Bulgars decided to join the fun, revolted against Avars and apparently captured the treasure of Avar Khagans (he also might have been related to the dynasty of Bayan himself). He established alliance with the Byzantine emperor and left the Carpathian plain for the steppes of the Ukraine. He died there circa 650 AD and his treasure was buried in the sands of Pereshchepina. Byzantine coins found there are the emperor Heraclius’ payment to Kubrat for the alliance. Persian gold vessels are also part of that payment. Heraclius sacked Shah Khosrau’s great palace after the battle of Nineveh in 627 AD, that’s where this Persian gold comes from. After 636 AD, Heraclius was fighting for his life facing the Arab threat, he needed alliance with Bulgars and peace on the Balkan front more than he needed Persian gold, so he gave it all to Kubrat. What would we conclude from finding only a few of the many clues in this collection? It’s in the nature of treasures to consist almost entirely of objects taken out of their natural context. The treasure itself tells very little of who dug it down, but a lot of who they met in trade and war. Without any extrathesaurial clues to the owner, the attribution and interpretation will always be open to reinterpretation. It makes for a lot of fun triangulation, though (and SFR does a nice job at it). Also Unterländer et al (2017). Ancestry and demography and descendants of Iron Age nomads of the Eurasian Steppe. I would argue that one may also search for clues about Avar origins among the Dulebs (historically described as being under the Avar yoke around the Carpathians), and maybe other Medieval and contemporary Westerly Slavs, since they may have experienced the last pulse of the nomadic admixture in the Avar era (and when multiple waves of admixture from similar sources have occurred, it becomes hard to see the earlier events behind the more recent ones). According to Yunusbaev 2015, North-Central Asian admixture in the typical Eastern Slavs dates back to the Khazar / Bulgar era and postdates the Avar times. So the Eastern Slavs / Russians (with a possible exception of the Westernmost Russians studied in the very recent publication of Zhernakova et al.) may have the hypothetical Avar traces obscured by the later events. Ultimately, all Slavs had warrior elite originating in the Avar Khaganate. Of course, Avar military was mostly non-Avar and composed of various Germanic, Slavic, nomadic and even formerly provincial Roman elements. After the Khaganate collapsed for the first time in the 7th century, the non-Avar military elite who revolted against the Khaganate went on to form the elite of the successor nations – some Slavic, some not (all four types of Bulgars, for example). They kept the memory of their origins for quite long time. For example, the Polish nobility believed that it is descended from nomadic conquerors (and thus had a right to lord over Polish serfs). After a long time, the Slavs sat down on the Danube, where the land is now Hungarian and Bulgarian. From those Slavs, the Slavs dispersed to other lands and were called by their names from the places they sat down on. So some came and sat on the river by the name of Morava and were called Moravans, while others called themselves Czechs. And here are the same Slavs: white Croats, and Serbs, and Khorutans. When Volokhs attacked the Slavs of the Danube, and settled among them, and oppressed them, then these Slavs went and sat on the Vistula and were called Lyakhs, and from those Lyakhs originate the Poles and others are Lyutichi and others are Mazovians and others are Pomorians. Similarly, these Slavs went and sat down along the Dnieper and called themselves Polians, and others came to be called Drevlians, because they dwelled in the forests, while others sat between Pripyat and Dvina and called themselves Dregovichi, others sat along the Dvina and called themselves Polochane after the river Polota that flows into Dvina. The same Slavs, who sat down near the lake of Ilmen, called themselves Slovene, and built the city, and called it Novgorod. And others sat down along the Desna, along the Seim, and along Sula, and called themselves Severiane. And so did the Slavic people disperse. This is pretty good description, but it must be stressed that this “dispersal of Slavs” from the Danubian basin was actually migration of the rebel military elite who split from the Avar Khaganate in the 7th century civil war. They apparently spoke Slavic which was lingua franca of the Avar military, but their ethnic (or racial, for that matter) origins were likely to be very diverse. The idea which intrigues me a lot – as I mentioned, the Bulgars were originally part of the Avar Khaganate and lived in the Carpathian basin and were an important part of the Avar military. So, the question is what language did they speak? It is believed they spoke some form of Turkic (Oguric Turkic, Chuvash is the only extant language of this branch). No doubt they did speak it originally, but did they keep it after living in the Avar Khaganate for several decades where the Slavic was lingua franca? Could Asparukh’s Bulgars have been Slavic speakers all along? And the supposedly Slavic Balkan population they subjugated – how Slavic they actually were? Maybe, it was the Bulgars who imposed Slavic language on the settled population of provincial Roman origin (and speaking some form of late Latin no doubt), not vice versa. This would explain a lot about early Bulgarian history. Danubian Bulgars of Asparukh, Volga Bulgars, Bulgars of Khazaria, Kuber’s Bulgars in Sirmium and even Italian Bulgars of Alcek. Supposedly Turkic Danubian Bulgars left no documents written in Turkic language. A few phrases or words found in Slavic documents (or in archaeological finds) can’t be reliably read as Turkic. To me this strange situation suggests that perhaps the Danubian Bulgars weren’t as Turkic as we were led to believe. Why not? English is a lingua franca, and at least 90% of the people in the Netherlands speak it, but there is not the slightest trace (or chance) of losing Dutch. If 10 thousand Dutch warriors (all bilingual in English) went to conquer a Romance-speaking country and used English to communicate with the natives, they well might lose it. If they didn’t bring Dutch women with them, then probably yes. But nomads took women and children with them: that’s almost the definition of “nomadic”. But Turkic Volga Bulgars didn’t leave documents written in Oghur Turkic until centuries after the emergence of Volga Bulgaria either – yet Chuvash is extant so no one doubts that the language was spoken there even though no early inscriptions survived? Danubian Bulgar inscriptions are typically in Greek (not in Slavic or Latin-related languages), with a few fragmentary Turkic words inscribed either using Greek letters or Orkhon runes. So while these early inscriptions leave open a possibility that the Danube Bulgars were losing their Turkic language already (if they didn’t merely rely on pre-existing use of Greek in administrative purposes), they give no reason to believe that the lingua franca of the land was Slavic at this early point. Conversely, there are strong reasons to believe that much of the Southern Balkans already spoke Slavic before the Bulgars. The empire’s struggle to ward off Slavic threats is well documented, and it appears that almost all inland Balkans effectively moved out of Byzantine control, having been overrun by the Slavs. The massive infusion of Steppe DNA into the peninsula Greeks is also well attested in the contemporary DNA studies, and without a question attributed to the wide-scale migration of the Slavs as far South as today’s Greece. Instead, Christopher Culver deconstructs the expression as “John the Warrior, khan’s customs tax overseer” (Bulgar Turkic throughout), in full agreement with the known role of similar lead seals in taxation of transported goods. There’s that annotated list of rulers, written in OCS except for one or two words after each name. Some of these words end in consonants, not in ъ. They all make sense as ordinal numbers once they’re compared to Chuvash. Also some people argue that the runic addendum at the final line of the Kievan Letter of the Cairo Geniza (6 symbols in total) is an approval mark of a Danube Bulgar official, who then would turn out to have used Orkhon runes (not just Greek). Although others argue the letter dates no earlier than XI c. and therefore the runic line may only be Khazar. Since a couple of given names of the Jewish signers of the letter are Turkic, it makes at least some Khazar connection inevitable. One given name, GWSTT, is explained as Slavic “Gostyata” (it is well attested in Novgorod in the following centuries, but may have had a wider geographic spread in the merchant class in other areas too … Novgorod is just lucky to have so many birch bark letters preserved). The first letter of name of the city, Kiev, isn’t 100% legible, but a combination of Turkic, Rus’, and Hebrew personal names makes the attribution to Kiev of the Khazar age quite convincing. The problem with Chuvash, we don’t know if the Volga Bulgars spoke it. Historical evidence suggests that the Chuvash are not descendants of Volga Bulgars. E.g, Ibn Fadlan says that the Bulgars were Muslim since 10th century while at the time of Russian conquest the Chuvash were still pagans. Ivan warrior of the khan and man of “irtkit” (with some inventiveness, one could even claim “irtkit” meant “customs” in 9th century Mongolian). A very tangential question about Turkic etymologies and West Europe. Our hills are awash with dogtooth violets now. The scientific name of the European sister species means the same in Latin, “denis-canis”. The Russian name “kandyk” кандык means the same but in Turkic languages, according to Vasmer. Is it an independent invention of the same unusual name in Europe and Asia, or a calque of some sort? And if it isn’t independent, then what is the borrowing direction? He’s aware of the bug and working hard to fix it! Ibn Fadlan says that the Bulgars were Muslim since 10th century while at the time of Russian conquest the Chuvash were still pagans. I would assume that the Muslim influences started in the urban core of Volga Bulgaria and didn’t yet spread far into the remote countryside. But the inscriptions of the Bulgars are Muslim / Arabic script throughout and they show evidence of two local languages, an Oghuric one (related to Chuvash) and a Kipchak one (related to Tatar). So there is little doubt that a language linked to the later Chuvash has been spoken by Volga Muslims. I’ve been thinking for a while that the Balkan Slavs may have been the commoners who settled in Pannonia and environs under the Huns, but the Sarmatians of the 3rd-4th centuries may be a better suggestion. The organization of Sarmatian society in two sharply delined classes, mounted aristocrats and settled farmers, seems old and well-established. When the Sarmatians fled for the Goths, their subjects moved with them into Pannonia, where they settled for a few generations. Under the later Germanic and Hunnic invasions of Pannonia they crossed the Danube into the Roman Empire, and when the Sarmatian aristocrats were crushed by the Huns, or maybe by the Goths fleeing the Hunns, the Slavs appeared to the eyes of the world. Incidentally the “recently commented posts” tool seems to have a bug, JC! It wasn’t a bug so much as data corruption, and the design of the system (which runs once a minute) trades off the easy ability to recover from such corruption for speed. In the new version, now up and running, the process that re-creates the page from scratch (which involves downloading almost everything on the site) is now formalized in code rather than done ad hoc by me. That means recovery from future data corruption will be easier and quicker. Unfortunately, while this was going on, all comment updates were missed, as I learn about them by scraping the home page, and while the system was down the scraper wasn’t running (another defect of the design). So some links aren’t to the last comment, and some pages may appear in the wrong order. To fix this, I’ll rerun the full re-creation tonight, probably around midnight New York time (UTC-4); comments made in the following three hours or so will be scraped, saved and applied when the re-creation is complete. If you continue to see other bugs after that, in particular if the last link on the page is not as expected, please notify me at cowan@ccil.org. Thanks to ktschwarz for doing so this time, and my apologies to all for blowing off his initial complaint until things got much worse. As a benefit, I do now have a nearly full backup copy of the site and can easily create new ones as we go. Rarely have apologies been less called for. Heartfelt thanks for what you’re doing. Test comment to see if everything’s in order now. Update: Lookin’ good. I’ll start the rebuild in about 3 hours. @John Cowan: I’ve refreshed it a few times, as new comments have shown up since your 9:05 post, and it seems to be working without a hitch. And, of course, we are all extremely grateful for the purely voluntary work you put into this project. It does so much to keep the Language Hat community operating smoothly—as, of course, do your frequent and knowledgeable comments. Dankon! I guess with so much of “accumulated wealth” of LH threads, the what-happened-lately tool has become even more valuable than before, because so many discussions may be advancing – by quite a few messages each – on any given day now. One more possibility to make it more visible may also be to increase the number of recent comments displayed at LH’s own widget. The Recently Commented Posts rebuild failed last night, so I’m going to kick it off again now. The hold-all-updates feature should make this safe to do even during active commenting periods, although it hasn’t been really tested yet. Expect a certain amount of instability on the page today as I work out bugs. I don’t have access to the paper, but does this mean that there was a total replacement of the presumably Finnic peoples who lived there before, or (as I suspect) that a certain genetic component arrived and split at that date. Okay, the rebuild is complete; it ran for just short of three hours. Hopefully everything should be correct now, modulo issues from the conversion to WordPress that occasionally garbled the order of comments on a post (you can sometimes see responses before the comments they are responding to), and as a result some posts may still appear out of order on the page because the physically last comment (which is what I look at) is not the latest comment temporally. Nothing much I can do about that. But do report any other issues either here or directly to cowan@ccil.org. The oldest comment in the system does in fact appear on the post listed last on the page, which is a good sign. UPDATE: Damn, broken again (different issue). Rerunning just the last part of the rebuild, which should be quick. UPDATE 2: Working again. A few updates may have been lost. does this mean that there was a total replacement of the presumably Finnic peoples who lived there before, or (as I suspect) that a certain genetic component arrived and split at that date. They see Finnic component in the Russian populations further North and East from previous publications of the others, but fairly little in their Pskov and Novgorod samples. It could be partly by design since they avoided adding more classic Finnic sets to their Admixture run, and stuck with a low K value which maximized the appearance of homogeneity in their Russians. But even these Russians are better described as more substantially Finnic, the population size and trajectories estimates should still be close. I think you mean Xiongnu Archaeology – Multidisciplinary Perspectives on the First Steppe Empire in Central Asia. 2011. Ursula Brosseder and Bryan K. Miller (Eds. ), Bonn Contributions to Asian Archaeology, vol.5. Bonn: VFG-Arch Press. Pdf here (650 pages, 50 MB). Not his new book, but still very interesting. But even these Russians are better described as more substantially Finnic, the population size and trajectories estimates should still be close. I understand that. Of course, a full population replacement needn’t have been brutal, if the two populations just didn’t interbreed and the Finns gradually retracted from the area. I believe they were slash-and-burn farmers at the time, so they might not have bothered fighting for land when there was plenty of it further north and east. a full population replacement needn’t have been brutal, if the two populations just didn’t interbreed and the Finns gradually retracted from the area. I believe they were slash-and-burn farmers at the time, so they might not have bothered fighting for land when there was plenty of it further north and east. But it goes w/o saying that the Russians carry plenty of linguistic, cultural, and genetic baggage from the Finno-Ugric tribes, so much so that most consumer genetics labs conflate contemporary Russian and Finnish ancestry to a substantial degree. In the 2018 Ethnicity Estimate White Paper, Ancestry.com goes as far as to explain that they determine “Finnish and North-Western Russian” ancestry as one combined bin (as opposed to less accurately identified combined bin for Eastern Europe and Russia). In the most recent incarnation of 23andMe’s ethnic composition analysis, my own DNA is described as 3.5% “Finnish” in long chunks, no doubt through my Russian great grandmother who hailed from the area of Arkhangelsk. It may be only nominally “closer to Finnish than to Eastern European” yet sufficiently distinct from Finland proper, but as you can see, one can draw the lines differently. I wondered what the amateur population genetics community of Russia has to say about it, but didn’t find any mentions of the new paper. On the “Genome Russian Project” website BTW, they do pledge to release all the data in accordance with the international standards, but not before publication. Incoming Russians also adopted slash and burn agriculture – well the natural conditions in the region hardly allow anything else. So whatever accounts for Russification of the North, it can’t have been demographic advantage of a more intensive agriculture. As usual, I have a pet theory here. There was an interesting phenomenon called “monastery colonization”. Russian monks lacking real deserts which Syrian monks used, have chosen to go into the northern wilderness for spiritual advancement and they founded literally hundreds of monasteries all over the region. Being celibate monks they are unlikely to have contributed to the genetic pool of the local population, but they certainly changed the character of the land, making it an integral part of “Holy Russia”. 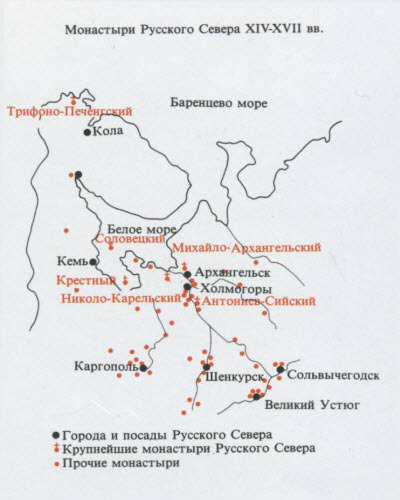 Map of the monastery colonization of the Russian North in 13-15th centuries. The result was not only an influx of Russian settlers, but also raising of the prestige of Russian language and culture and of course religion among the local Finnish population. By 16th century, the population of the region was already Russian-speaking and identified itself as Russian (without any real population displacement). Nice map, That would help explain russification with little genetic replacement, which I think is true for most of the northern regions, but not full replacement, which may or may not be the case for Novgorod and Pskov. The identification of a common genetic strand across Russia from Pskov to Yakutia seems curious when presented as a main finding. It looks more like an attempt to support a claim of unity than to explain the population history of Russia. I don’t doubt there is such a strand, but I’d think it’s a trivial North Eurasian element (like e.g. West Siberian HG), or maybe a combination of North Eurasian elements, spread widely in the Taiga belt with Seima-Turbino and in the Steppe corridor with just about everybody. It doesn’t explain anything about the rest of the contributors to the genome. Or a general claim of doing deep scientific interpretation. The grand achievement of the paper is sequencing of the genomes itself, in a very interesting part of the world’s genetic diversity which has yielded far too little data to date (and the founder of the projects said exactly the same when it was being launched 4 years ago, https://academic.oup.com/gigascience/article/4/1/s13742-015-0095-0/2707784 , and expressed hope that more will be gleaned about the past expansions and interinfluences of the Slavic, Turkic and Finno-Ugric groups which yielded the contemporary population of much of Russia). Another not-so-subtle point has been to mitigate the research stagnation and isolation from the global community which continues to permeate Russia’s sciences. Indeed, the leaders of the projects returned from the West with PhD degrees, are supporting their endeavor with various Western grants in other fields of genomics not limited to human population history, and actively train the new generation of researchers. Of course they need publications as they move down on their path, and I can only guess that the project is lagging behind and they set out to publish the first handful of genomes, which don’t really provide enough data for any major conclusions … yet one has to conclude something, anything in order to publish a paper? Wait a minute, why there would be any Finns in Pskov or Novgorod? I thought the area was populated by Balts before the Slavs came, not Finns. I would love to see the references, but I also think that it may not matter from today’s DNA viewpoint. For one thing, Baltic and Slavic ancestral peoples were much closer to one another genetically, and it may be impossible to separate their contributions to modern DNA. 2ndly, there was an abundance of Finno-Ugric tribes in and around Novgorod / Pskov lands in later centuries – Ingrians, Vepsians, Karelians, Estonians, Livonians – who could have contributed to the population makeup even at much later time than the initial settlement of Novgorod (including Orthodox Christian refugees from Swedish wars in much later centuries). And then there were the Norse, possibly even before Slavs or at least at about the same time (but Germanic peoples are in general also too genetically similar to Balts and Slavs to tell apart a millennium later). Attempting to return closer to the Avar topic from there 🙂 doesn’t the earliest mention of the Rus’ in Annales Bertiniani describe the 832 CE “Rhos” emissaries returning from Constantinople as people whose origin is Swedish and who are the subjects of Khagan? (and the founder of the projects said exactly the same when it was being launched 4 years ago, https://academic.oup.com/gigascience/article/4/1/s13742-015-0095-0/2707784 , and expressed hope that more will be gleaned about the past expansions and interinfluences of the Slavic, Turkic and Finno-Ugric groups which yielded the contemporary population of much of Russia). Another not-so-subtle point has been to mitigate the research stagnation and isolation from the global community which continues to permeate Russia’s sciences. Indeed, the leaders of the projects returned from the West with PhD degrees, are supporting their endeavor with various Western grants in other fields of genomics not limited to human population history, and actively train the new generation of researchers. … and we arrive at my speculation about the Hungarian paper above: That the project of the scientists is wide in scope, but the questions asked in the early papers are taylored to increase public interest and political goodwill at home. SFR: I thought the area was populated by Balts before the Slavs came, not Finns. Of course they need publications as they move down on their path, and I can only guess that the project is lagging behind and they set out to publish the first handful of genomes, which don’t really provide enough data for any major conclusions. There are a variety of skills, distinct from doing research, that are useful for an academic scientist. The most important is convincing the funding agencies to provide money for one’s research, and I have not proven to be very good at that. On the other hand, there is also the skill of convincing the editors and referees at the best journals to publish one’s work, and that I am really, really good at. I have sometimes wondered whether I could make better money selling my skills to other scientists, helping them get published, than I make as a mid-career faculty member; however, even if I could, I suspect it would be a miserable existence. Pskov and Novgorod regions fall almost entirely in the zone of Baltic hydronymy. Only the northern part of Novgorod land can be regarded as Finnish. Dmitry: Attempting to return closer to the Avar topic from there 🙂 doesn’t the earliest mention of the Rus’ in Annales Bertiniani describe the 832 CE “Rhos” emissaries returning from Constantinople as people whose origin is Swedish and who are the subjects of Khagan? [T]he identification of the people named ‘Rus’ or ‘Rusiyyah’ in the medieval Arabic geographical and historical literature has long been disputed, especially whether they are to be regarded as Scandinavian or Slavic. Their name bears an obvious resemblance to that of the predominantly Slavic state that emerged in and around Kiev in the tenth century, known as Rus, which ultimately converted to Orthodox Christianity and became the embryo of Ukraine, Belarus, and Russia. A perusal of the Arabic sources, however, demonstrates that they mostly concern not the Kievan Rus but rather a distinctively different yet homonymous group (or groups) of people in a much more easterly region. In this article I will outline my position that Rus as a historical entity may be dealt with, broadly speaking, as two distinguishable groups: on the one hand, Kievan Rus; and on the other, what I will term here ‘Volga-Caspian Rus’. In very general terms, I suggest that the Rus in Kiev should be regarded as predominantly Slavic, although incorporating a significant Scandinavian element which gradually diminished in the course of the tenth century. By contrast, the ‘Volga-Caspian Rus’ were predominantly Scandinavian, or Viking, merchants and warriors who eventually disappeared or integrated with local peoples beyond the point of being a distinguishable entity by the early eleventh century. The Arabic sources thus clearly delineate a special relationship between the Rus and the Khazars on the one hand and the Volga Bulghars on the other. This relationship appears to have rested mainly on trade and diplomatic conventions that were lucrative for all three of them. Several sources from a later period may also be seen to reflect this situation, with some classifying the Rus as ‘Turks’, perhaps on account of their close contacts and prolonged sojourns in Khazaria and Bulghar. An example of this is the Mujmal al-Tawarikh, which refers to the Khazars and the Rus as brothers (Bahar 1939). The famous geographer Al-Idrisi, writing in the twelfth century, claims that Kiev (Kuyabah) is the city of the Turks called Rus ( Jaubert 1836–40, ii, 401), and in the following cen-tury Al-Qazwini similarly writes that the Rus are a large grouping of the Turks (Wüstenfeld 1849, 393–94). The renowned historian Ibn Khaldun mentions Rus along with the Volga Bulghars and several other peoples, stating that they are all Turkish tribes. This association between the two ethnonyms seems to have persisted for some time, as evidenced by the writings of Ibn Iyas from the late fifteenth century or early sixteenth century, where it is asserted that the Rus are a large grouping of the Turks. Such references may also be aligned with information found in several different sources, such as the Annals of St Bertin (s.a. 839), the writings of Ibn Rustah c. 900 (Goeje 1892, 145), and the anonymous Persian geographical work Hudud Al-Alam from the late tenth century (Minorsky 1970, 159), to the effect that the leader of the Rus bears the title khaqan, or ‘kaghan’. ‘Kaghan’ is in fact a well attested title among the Turkic peoples, including the Khazars (Golden 1992). This particular issue has been widely commented on and, by extension, has raised the question whether a Rus Kaghanate in fact existed, a topic which I shall address in a separate article. It makes me wonder if the name Hákon might actually be a folk-etymological Scandinavian form of the title khaqan. The literal meaning of Hákon certainly fits, and so does the timeline — barely. As far as I know, the name first appears in Scandinavia on runestones from the Viking Age, and there are persons in the sagas named Hákon born in the 9th century. Very interesting — thanks for the quotes! And they expelled the Varyags to over the sea, and did not give them tribute, and began to own themselves, and there was no order among them, and the clans rose against each other, and they were quarrelsome and fought each other. And they said to themselves: “Let us look for a prince who would own us and judge according to the law”. And they went overseas to the Varyags, to the Rus. Those Varyags were called Rus, as others are called Swedes, and others Normans and Angles, and still others Gotlanders, and so are these called Rus. The Chud, Slovenes, Krivichi said to the Rus: “Our land is great and rich, but there is no order in it. Come to reign and own us.” And three brothers were elected with their families, and they took all of Rus with them, and they came, and the eldest, Rurik, sat in Novgorod, and the other, Sineus, in Beloozero, and the third, Truvor, – in Izborsk. And from those Varyags was named the Russian land. We learn from this that the Rus were Germanic (possibly Scandinavian) people related to Swedes, Norwegians, Anglo-Saxons or Gutes (from Gotland island). I note that one Scandinavian nation is conspicuously absent from this list. I am talking about the Danes, obviously. This suggests that the Rus was just another name for Danes (or a group of Danes). Rorik of Jutland, well known Danish Viking, is a good candidate for being Rurik the founder of Russia. Interesting may be, but I edited it right back to you, All for a misbegotten capital S in “sagas”. Is it controversial that the Rus (narrowly construed) were Norsemen? If I may also narrowly construe ‘Norsemen’ as Western Scandinavians, so yes. The standard tale is that they were mostly Swedes, and that the region of Roslagen (another “Danelaw” parallel) on the Swedish coast is somehow named for them. It definitely existed later on. Cool, thanks. It isn’t as clear-cut in the paper, IMO. The question of quantitative comparison of Finnic vs. Baltic hydronyms isn’t settled there, although the author notes that many Finnic hydronyms North of Novgorod may date only to the 1600s migrations. There remains little doubt that the Baltic influences extended to Lake Ilmen (considerably North of where the earlier researchers expected them to peter out), but the absence of Finno-Ugric toponymic substrate isn’t by any means suggested. The previous major study of the Slavic DNA did find that while Poles, Belarusians, Ukrainians and non-Northern Russians were extremely close to each other, they also shared a lot of DNA with the Baltic and Finnic groups. And so did Mordvins.